Travel Supermarket are holding a competiton to showcase your holiday look, weather it be hair, make up or nail.. or all three! I dont wear make up or do anything with my hair so it look like nails is going to be my choice! When I go on holiday I always love to have bright nails to shine in the sun. I got myself some floursecent nail varnish this year which was perfect for the clubs of malia (where iIwent this summer) with their UV lights! But I didnt just leave it at that. 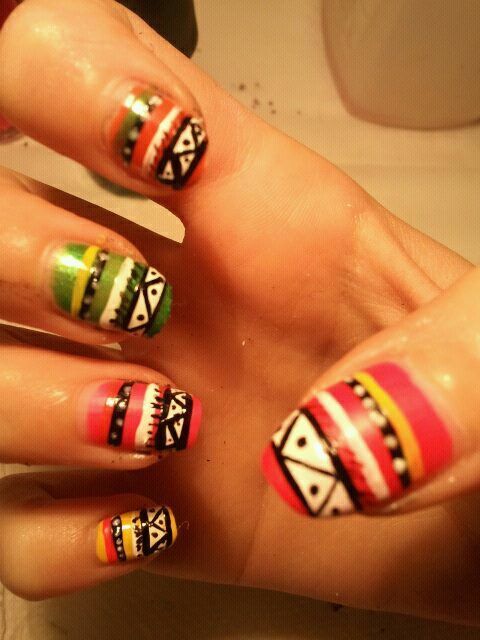 Aztec has been big on trend this year and I thought this would be a great idea to try out as nail art! It is quite simple to do but youy need a steady hand, although it looks very intricate and very impressive! and this is how I did it! With nail art blushes, paint a very think white line just before the end of the nail and then a thin white line under that leaving a gap of colour in the middle. These are amazing! So impressed!